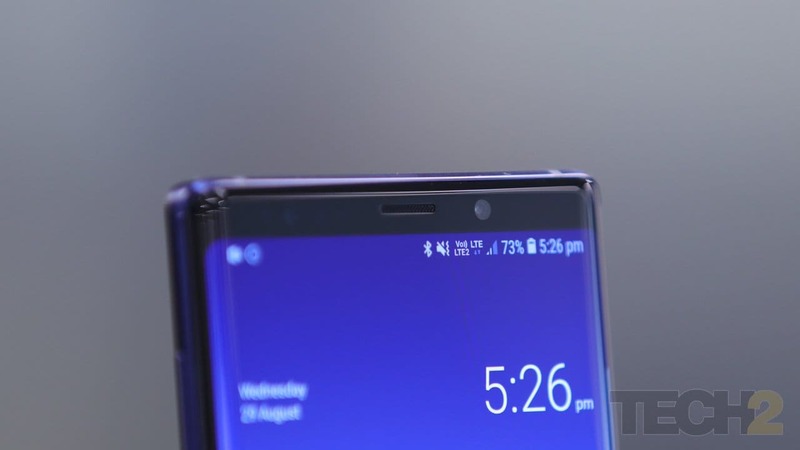 The Samsung Galaxy Note 9 may only arrive with small changes, but those small changes add up. It's the best Note yet, and it's worth every Rupee you intend to spend on it. 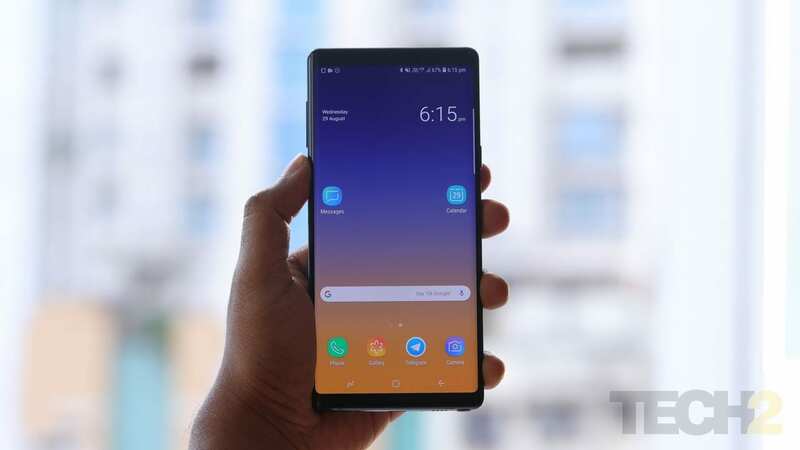 The new Samsung Galaxy Note 9 is here and yes, it looks very similar to the older Note 8. As I wrote in my first impressions and in the camera comparison, however, there is a hint of change in the new Galaxy Note 9. After using it for a week, I have to conclude that it is no longer the productivity device that’s aimed at businessmen in suits, or the creative types who apparently cannot stop sketching. 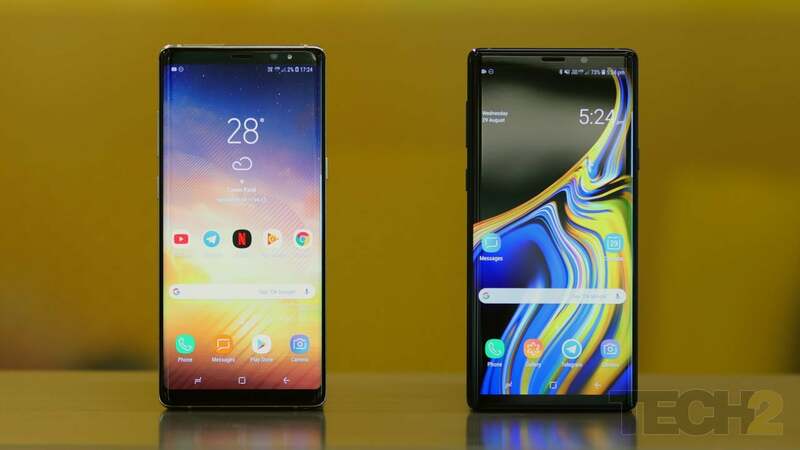 With the Samsung Galaxy Note 9, Samsung is now looking beyond the Note and more importantly, is sort of setting the stage for better things to come, a stage for an entirely new type of Note. If you are wondering what that is, think folding tablets, which could arrive as soon as next year. 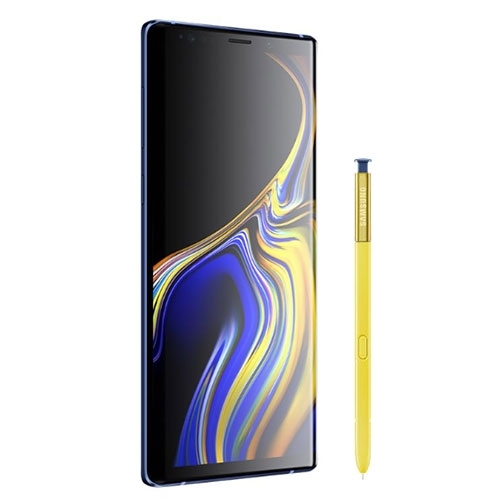 The new Note 9 features a bigger display, a broader footprint, a bigger battery, dual speakers and a smarter S Pen. It packs in the latest chipset from Samsung and even comes with a whopping 512 GB of internal storage that can be expanded to 1 TB. There’s also a focus on keeping the smartphone cool while gaming. 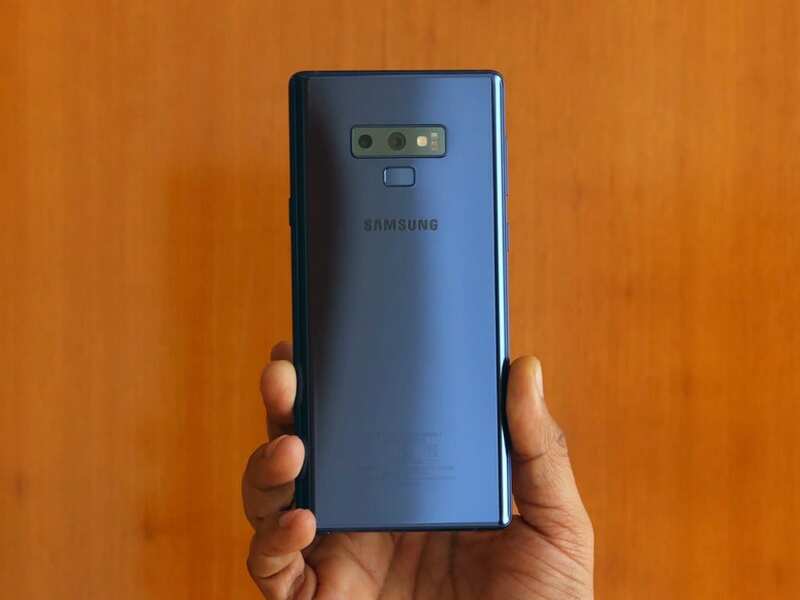 So yes, the Samsung Note 9 not only caters to power users and smartphone camera enthusiasts, but for the first time, also comes with bragging rights that will attract mobile gamers. And this is why this year's Note is so different, despite sharing the old Note's design. If you fall into either of those categories, there's nothing out there that can beat the Note 9. 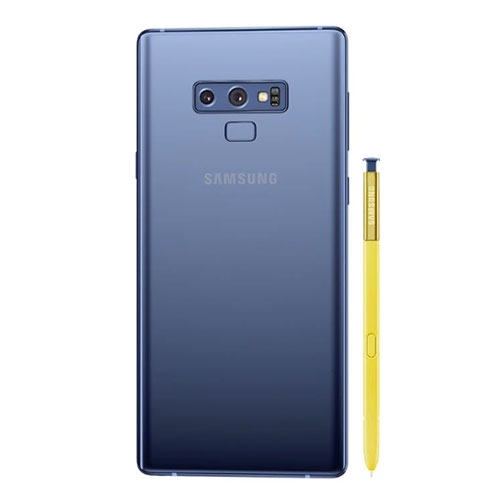 While everyone’s ranting about how similar the Note 9 looks when compared to the Note 8, they are different enough. The new Note 9 feels broader when you hold it in one hand and is also heavier at a hefty 201 grams (that’s 49 grams away from a quarter kilo). While the device now comes with a matte finish, which feels grippier than the previous model, it’s not as rounded as the Note 8 around the corners but more blocky, with sharper edges that are more reminiscent of the Galaxy Note 5. Despite its weight, it feels solid and the finish of the device is top notch, one that fits well into the premium smartphone range. Where it does not exactly fit well is in your jeans pocket. I’m about 5' 7" tall and the phone almost peeps out of my regular straight fit jeans. Put on your tighter trousers and everyone will know what you're packing. 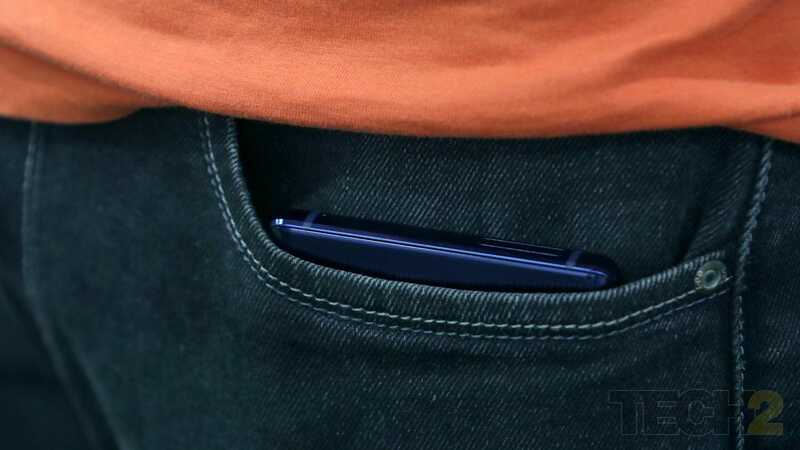 The Note 9’s big and chunky footprint makes it suitable for carrying around in a suit pocket or loose jeans. 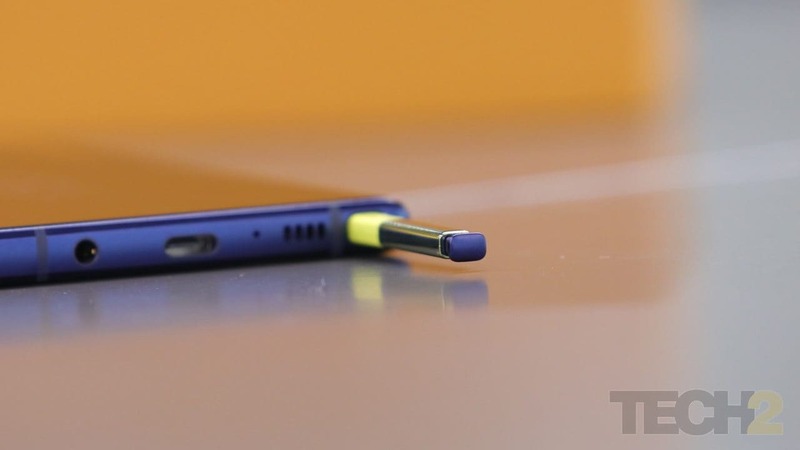 Strangely, the Note 9 actually feels large, unwieldy and at times annoying, and I think it's because of those corners, which are not as rounded as on the Galaxy S9. This was a problem even with the Note 8. It’s definitely a two-handed device and you risk dropping it when using it with one hand, whether you are placing calls or even responding to messages. 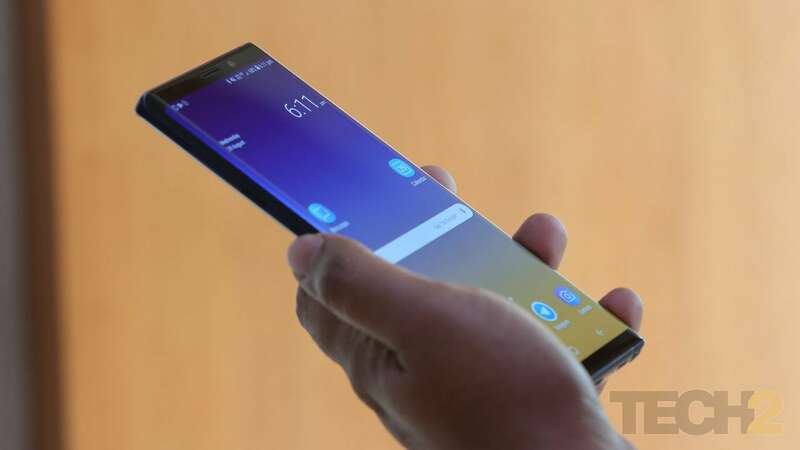 Samsung is aware that the Note’s size is overwhelming and like always, has included a one-handed mode that lets you swipe across the display diagonally (or press down on the Home button thrice) to resize the content for smaller hands. The only problem is that I need to activate this mode every time I unlock the device. Using the equally massive iPhone 8 Plus as my daily driver for months, I was surprisingly able to type better on the iPhone with one hand. I realised that it all boils down to the weight and the thickness of the iPhone, which gives you the confidence (read “courage”) to use it with one hand, despite the risk of dropping it. The new S Pen is well thought out and while it looks similar to the previous one, a lot has changed inside. There is now a super capacitor that holds charge and powers a Bluetooth LE module, which lets you use the S Pen as a trigger for presentation slides, as a physical shutter button while taking selfies and even as a tool for unlocking the device. It works really well for those who love to scribble on a notepad and even for those who love to take physical notes as the nib of the stylus gives you that resistance while writing on the glass screen. It’s just not all that useful as I hoped it would be. More details in the software section. 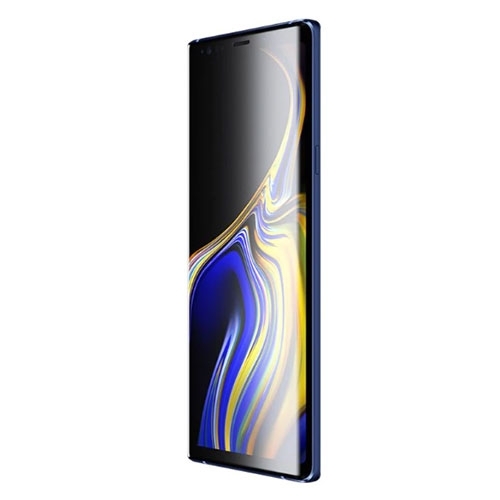 The Samsung Galaxy Note 9 features a 6.4-inch QHD+ SuperAMOLED display which beats the one on the Note 8. The Note 8 featured the best display we saw on a smartphone last year, so when I say it beats it, I mean that it's more colour accurate (in the Basic Screen Mode) and is a lot brighter as well. This also means that the content is more legible in direct sunlight. 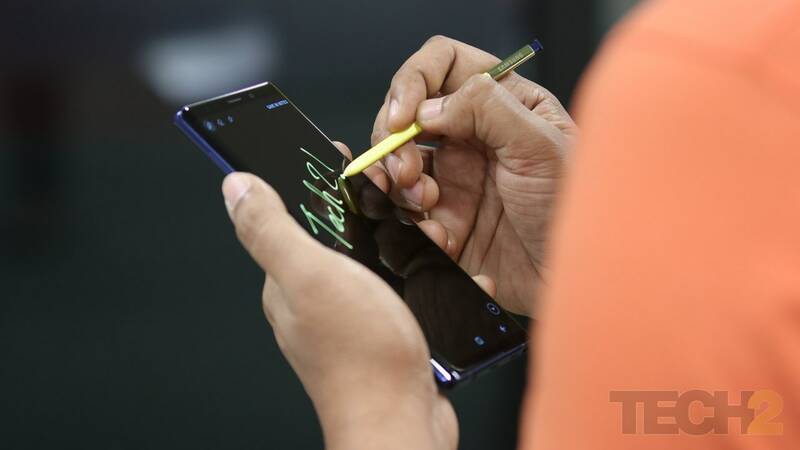 Note fans will notice that the display has grown from 6.3-inches on last year’s Note 8 to 6.4-inches on the Note 9. 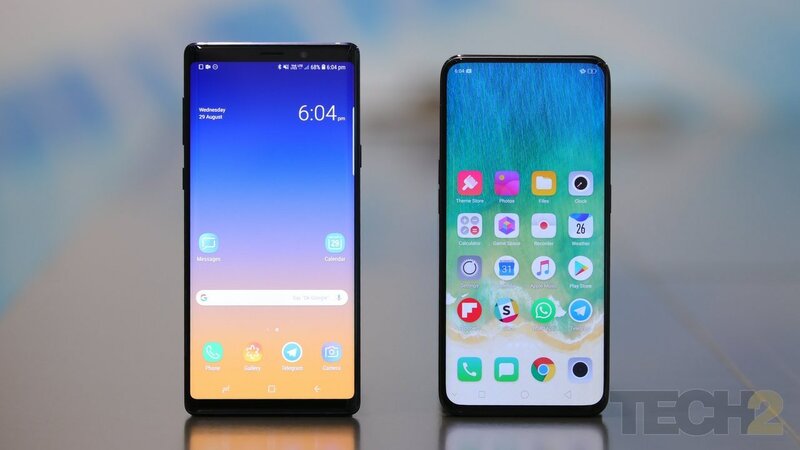 While I’m happier to see that quality of the display has improved, I’m not sure why Samsung went in for a bigger one as the older one seemed good enough at 6.3-inches. They could possibly be preparing for the upcoming iPhone X Plus that’s expected to sport a massive 6.5-inch display. One detail that I did not like are the thicker bezels. The new display on the Note 9 does not stretch around the curves on the left and right sides as much as it did on the Note 8 or the Galaxy S9. In short, this is not exactly an ‘Infinity Display’ as there’s plenty of bezel on all four sides. 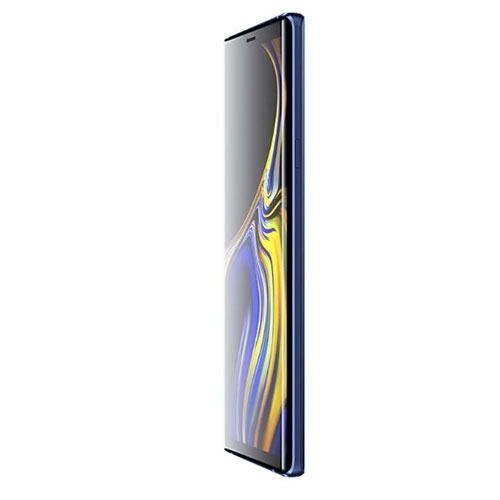 Next to the Oppo Find X, the bezels on the Find X are still thinner than those on Note 9 even at its thickest point (bottom bezel). In short, you could call the Find X a Ferrari and the Note 9 a Hummer (more so because it looks boxy this time around). Despite the thicker bezels, the HDR 10 compliance means that you will be able to stream and view HDR content on the display. And boy, does it look good! In fact, watching HDR videos on that massive display will make your forget the size of the device and appreciate the bigger battery that Samsung has squeezed in this year. 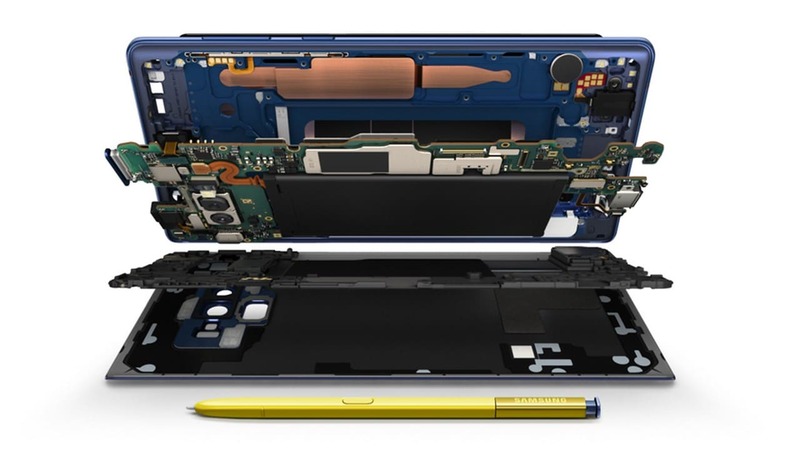 The Note 9 features the best possible hardware configuration on any Android smartphone available today. There’s a 6.4-inch QHD+ AMOLED display on the front with an 8 MP camera, iris scanner, and the usual proximity, ambient light sensors all tightly packed into the top bezel. Inside, the model sold in India gets an Exynos 9810 SoC which is also available on the Galaxy S9 and the S9+. There is a 6 GB RAM + 128 GB storage base model and an 8 GB RAM + 512 GB high end model. Indeed, RAM and storage is an area that draws the clear line between the Note series and the S series from Samsung. 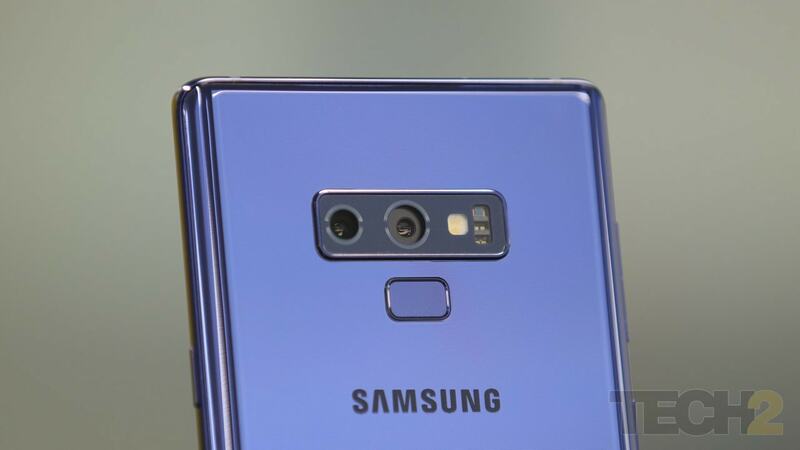 At the back sits a dual 12 MP + 12 MP camera with dual OIS, one that also includes the new dual aperture system from the Galaxy S9 on the primary camera. 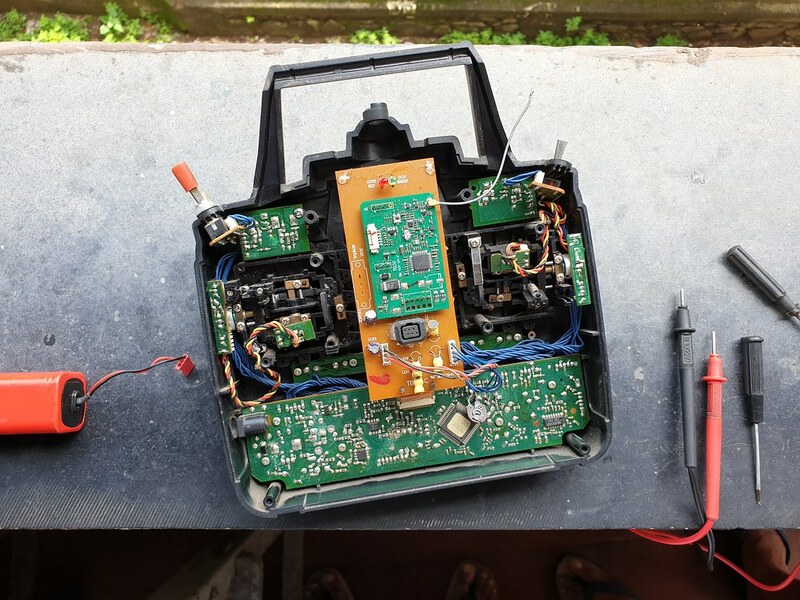 Connectivity options include everything under the sun including Wi-Fi 802.11 a/b/g/n/ac 2.4G+5GHz, Bluetooth v 5.0 (LE), NFC, GPS and a USB Type C port for charging and data transfers. And then there’s that fingerprint reader at the back, that’s now placed at a more sensible location. Powering it all is a 4,000 mAh battery. The Note 9 is no longer just a bigger Galaxy S9 but the highest specced smartphone offering from Samsung. The bragging rights alone will make people go green with envy. It’s indeed all about separating the men from the boys in the premium smartphone segment. Samsung did a great job with the Note 8 last year, with software that worked smoothly without any lag or stuttering, and things remain the same this year as well. Samsung’s Experience UI now feels fluid in day to day use, but it still has a learning curve, especially in the Settings app. Thankfully, there’s a search bar to get to where you want to go. The software on the Galaxy Note 9 is pretty much the same as on the Note 8. Another issue is that just that there’s so much bloat loaded on to the device that it feels annoying to see so many apps that you may never end up using as long as you own the smartphone. There are the usual set of Google duplicates (Notes, Gallery, Galaxy Apps, My Files, Internet, Calendar and more) that at times try and ape their respective counterparts. The other apps like the Voice Recorder app are well thought of and handy. The Game Launcher app is also a nice addition which has been improved with added performance customisations per game, which makes sense for gamers since the new Note will appeal to them as well. 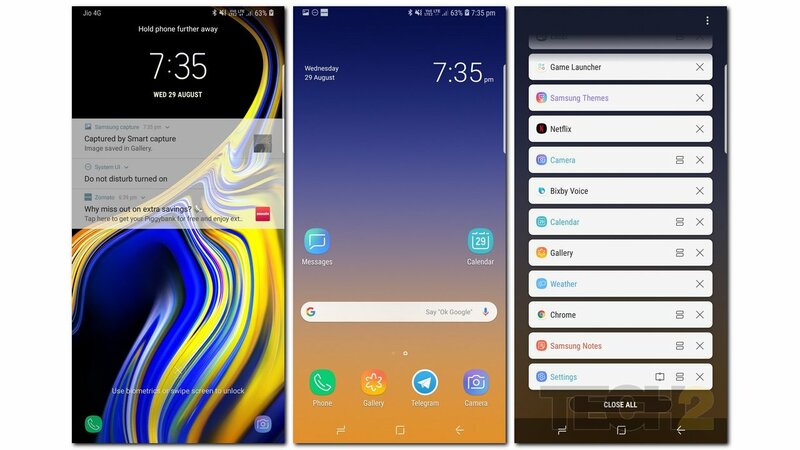 Apart from the above issues, a majority of the software remains the same as on the older Note 8 and the Galaxy S9+, which I reviewed a few months ago. But there are a few changes. Dex has improved to an extent and is a lot more practical as compared to the previous setup, which needed a Dex Station to run the large screen interface. The new Dex just needs an HDMI adapter/cable (USB C to HDMI cable) connector and a monitor to get you up and running. If you simply want to view presentations or files on a larger display, then you will not even need a wireless keyboard and a mouse as a part of the setup. This is because the Dex app will let you use the smartphone’s display (which is massive) as a big track pad and virtual keyboard, eliminating the requirement for having wireless peripherals on hand. Adding to this, the new Dex setup lets you use both the smartphone and the Dex app running on the PC independently of each other. This means you can continue using the smartphone as a smartphone to check your tweets, while the more serious stuff happens on your bigger monitor. The only problem with Dex is that not all apps are optimised to run on the bigger interface. While the native apps support the Dex interface, there are other essential apps that still do not run in the desired windowed mode. Again, Dex is not as most of us would like it to be, so you are better off with a laptop for more serious stuff. Bixby has barely improved, still leaving Google Assistant as the better choice. 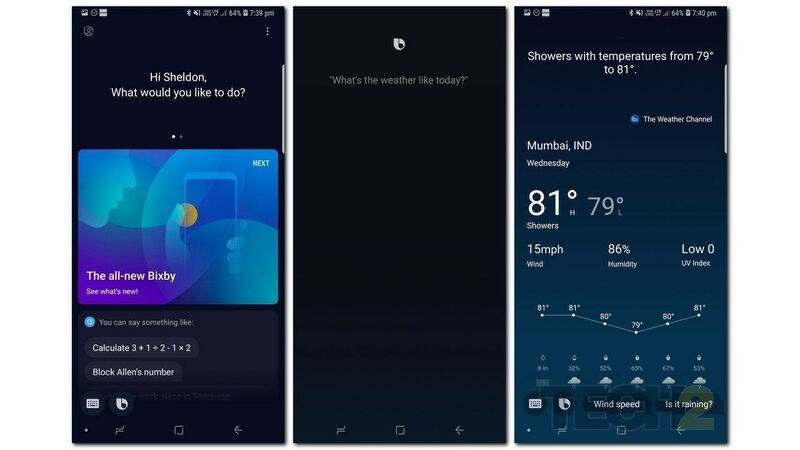 Bixby has barely improved on any front. Not only does it represent wasted effort on Samsung's part, it also adds a confusing button on the side that gets pressed down by mistake, and quite frequently at that. Bixby is unnecessary bloat that takes up what could have been a very useful button on the side of the Note 9. Every time I opened it, which was never by choice, I had to endure a frustratingly long wait as I attempted to dismiss it as fast as humanly possible. The S Pen gets a few new features, but they don't make it any more useful to the casual user. While I appreciate the new features added to the S Pen, its core software functionality has not improved by much. 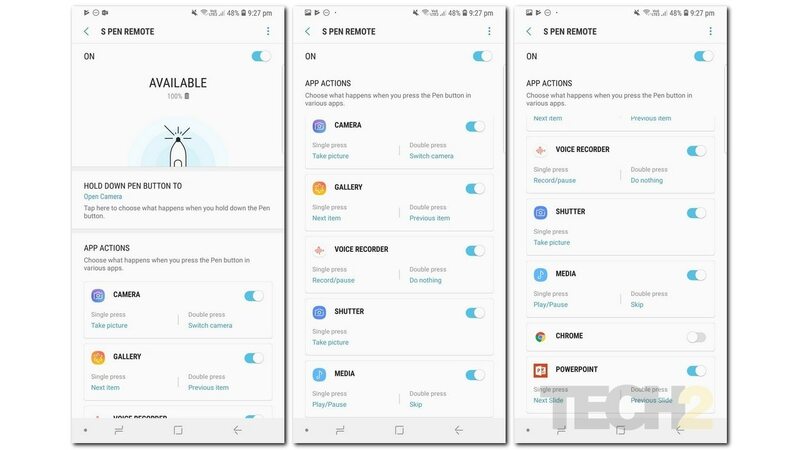 You can still do things like hover your pen on web pages to get an instant translation (which uses Google Translate, not Bixby) or even use the S Pen to send Live messages with sparkling text as GIFs or videos that will help you stand out in those massive family WhatsApp groups. The problem is that it’s not really useful and I often had to come up with reasons to use it. Which meant that I rarely ended up pulling it out of its slot in day to day use. I did use it to take photos where I could not really look at the viewfinder, (like when you hold it up high to capture crowds at a rock show), so it is useful, but just for that scenario, and it kind of does not add up considering the effort put in to add a super capacitor in there. 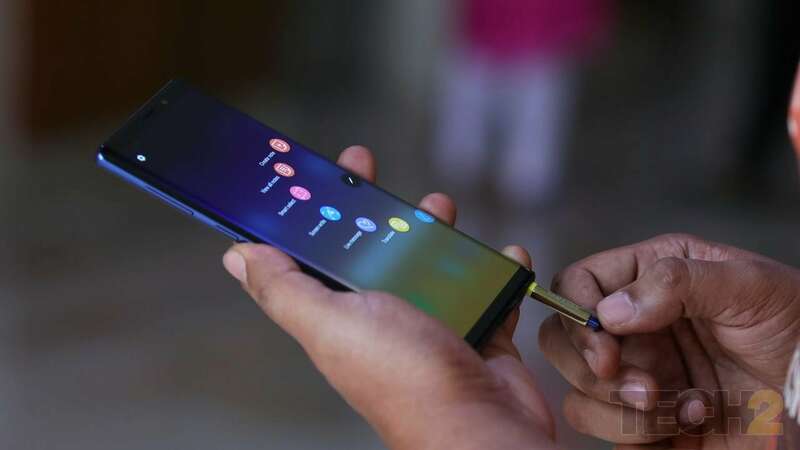 The S Pen may have been the highlight of the Note series since inception, but it’s really starting to get boring and could be the reason why Samsung added two speakers and a massive water-carbon cooling system to get the attention of gamers. And the launch of Fortnite for Android at the launch event kind of cements the Note as a serious gaming smartphone as well. When you buy a Note, there is one thing that you will never worry about and that’s performance. Apps open quickly and close quickly, there’s no lag, no stuttering and all the animations are smooth and quite fluid (though not as good as on iOS). And it won’t be on future Note devices as well, as Samsung is no longer afraid to double up on RAM (and storage) on its phablets. The Galaxy S series still sees some uncertainty on this front. Apart from the S Pen, gaming is the next big highlight of the new Note 9. I played, Fortnite, Shadowgun Legends and even the recently launched Asphalt 9: Legends, all of which ran smoothly when played on the highest settings and resolutions. I even set all the games to ‘Focus on performance’ using the Game Launcher app and they all played well without a hint of lag or stutter. This is impressive, mainly because this a device with a QHD+ display. While not a single game ran at the Galaxy Note 9’s native resolution, they ran smoothly at the highest in-game settings possible and with sustained gaming performance. Speaking of gaming, that was the inspiration behind the fancy "water carbon cooling" heat management system. The idea here is not just to bring down the temperature of the SoC, but to allow it to run longer, delivering good performance throughout a gaming session. For example, the phone heated up to 42 degrees centigrade (measured using a Fluke temperature gun) when running Shadowgun Legends at the highest settings possible in our mostly warm office air conditioning. The temperature rose quickly during gameplay, but thanks to the heat management system, the heat did not get concentrated in one area, which would have made it uncomfortable to hold. Instead, the heat was distributed along the entire length of the bottom half of the device (when held horizontally) and did not feel uncomfortable despite the heat. I could comfortably game for half an hour on the highest settings without worrying about the heat slowing down performance, which is what happens on most other Android devices that, sadly, need a good cooling system and don’t have one. What I loved about the Note is that I wouldn’t have noticed that the phone was heating up while gaming if I had a thick case on and this, according to me, is what matters. In short, the carbon water liquid cooling system does make a difference when it comes to sustained performance, but does not reduce the temperature. 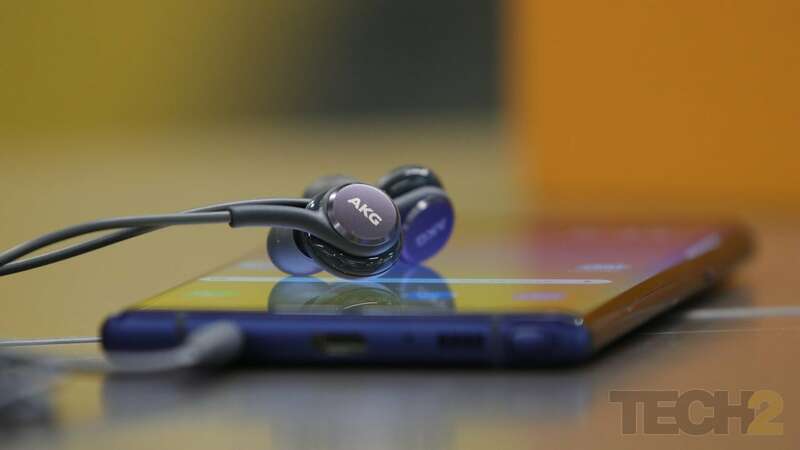 Audio quality was really good, delivering balanced treble and bass notes, which sounded great on the bundled AKG earphones. 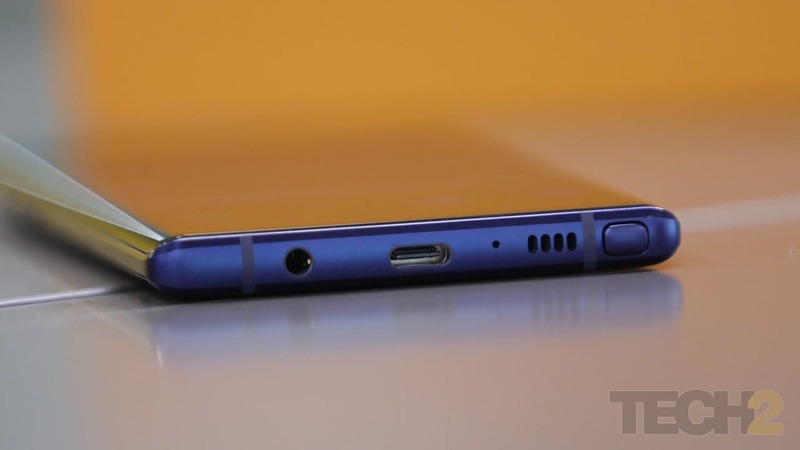 Talking about earphones, there’s still a 3.5 mm headphone jack on the Note. The audio quality is good, but it’s not as good as the audio on the LG G7+ ThinQ. The same goes for the speakers. They are really loud and very clear and even louder than those on the iPhone 8 Plus, but just not as loud as those on the LG G7, which I will be reviewing soon enough. The dual speaker set up tuned by AKG did make for an immersive gaming experience, with the bottom speaker handling the low frequencies while the earpiece speaker was in charge of delivering the mid to higher frequencies. Call quality was great and the audio was loud and clear. Last year’s Note 8 blew me away with its performance in all types of lighting conditions and this year’s Note 9, surprisingly, kept up despite my worries about the slightly problematic dual aperture system borrowed from the S9+. The Note 9 shot some crisp images, mostly at its f/2.4 aperture. This time around, the images shot at f/1.5 did not look as blurry as they did on the Galaxy S9+, even in low light. So Samsung has done some fine-tuning with the Note 9 when it comes to camera software. The same can be said about the dynamic range and you can read all about it, in detail, in my comparison of the Galaxy Note 9 vs the Apple iPhone X vs the Huawei P20 Pro. Despite the stunning amount of detail this smartphone can capture, there were a few problems. The portrait mode takes clear shots in broad daylight or outdoors, but that’s not the case indoors. In dimmer light, the images captured lack details. This could be because of the noise processing that would otherwise seem fine in the regular Auto mode in the same lighting conditions. The camera in Portrait mode also tends to over expose horribly when clicking photos outdoors in daylight. In short, in dimmer lighting scenarios, you are better off clicking a regular photo and I would recommend avoiding the Portrait mode unless there’s plenty of light around. As of now, the only smartphone that gets the bokeh effect right is the Pixel 2 and it surprisingly manages to do so with just one camera. The colours in low light are high on saturation, as you can check in the many sample photos I have added to the Flickr album. If you have purchased a Note 9, or are looking to purchase one, remember to switch the Screen mode under Display in Settings to Basic to get the real and most natural colours when viewing photos on that massive display. There’s almost no noise in dim lighting scenarios when shooting video at 4K 60 fps. The phone will not offer stabilisation in the 4K 60 fps mode (it’s mostly software) but it’s pretty good if you have steady hands. Turn down the setting to 30 fps and you get proper stabilization with OIS. However, once there is close to no light, noise finally creeps in. Slow motion footage is good as well and now you can record it for twice as long as on the Galaxy S9+. Video recording was really good with a good amount of detail in good lighting conditions and even in dim light. 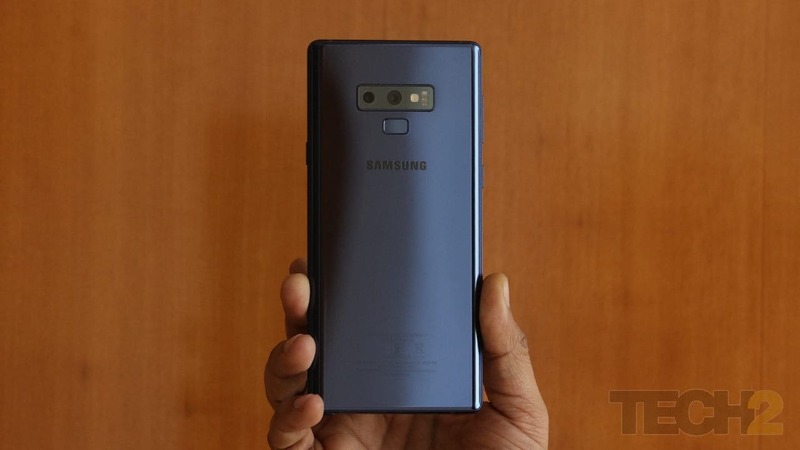 In short, the Galaxy Note 9, is the best camera smartphone when it comes to photos and videos, it’s just that its Portrait mode needs some work. With the Note 7 fiasco still fresh in everyone's minds, Samsung took baby steps with the Note 8. 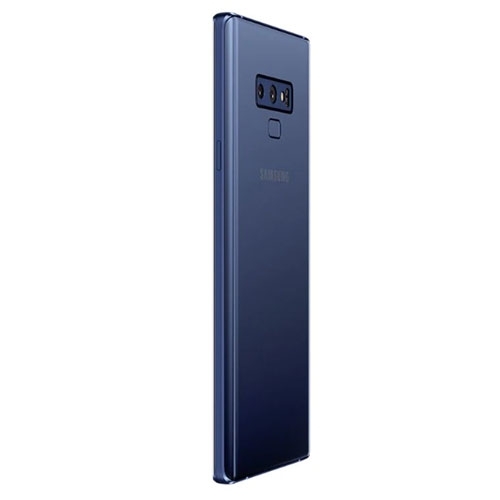 With the Note 9, they've finally taken a bold step and chucked in a 4,000 mAh battery, which is a significant bump up from the 3,300 mAh unit in its predecessor. The bigger battery definitely kept up with my daily usage, which involved shooting a lots of photos while attending functions and this was above the usual two email accounts, continuous WhatsApp, Telegram, Slack message, and an hour or two of gaming. I ran all games on the highest performance settings using the Game Launcher app, so the games did drain the battery fast. Thankfully, Samsung had plenty of optimisations in place, so setting the games to ‘balanced’ delivered better battery life despite the usual gaming sessions. Changing the Power saving mode to mid also works really well by lowering the resolutions of the display to FHD+, limiting the speed of the CPU and decreasing the brightness by 10 percent. The results were impressive and had me going through a whole day of photos (attending family functions) still leaving me with about 26 percent charge by evening. Battery life on the new Note 9 is pretty darn good! 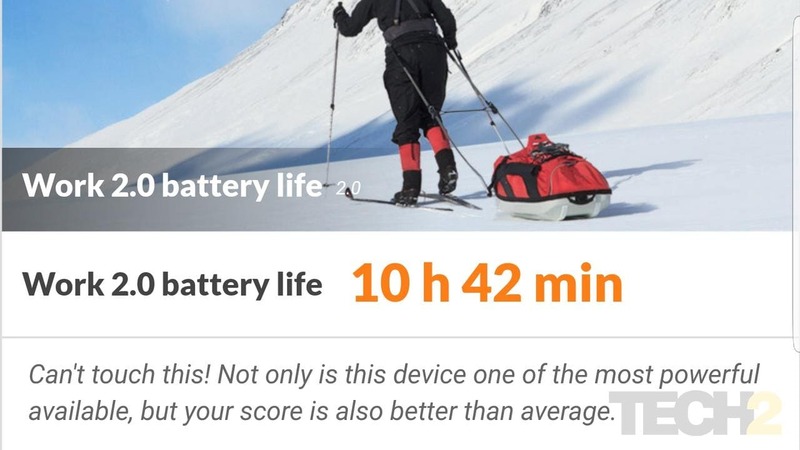 In the standard mode, the 4,000 mAh battery performed well in our standard PC Mark Work 2.0 Battery Life test as compared to the previous Note 8 (9 hrs 22 mins) and even the Galaxy S9+ (9 hrs 4 mins), giving a good 10 hours and 42 minutes. This is really good keeping in mind its QHD+ resolution and the fact that it packs in the biggest display, when compared to the S9+ and the Note 8. The Samsung Galaxy Note 9 is the best Note yet! It’s got the most number of features as compared to any other smartphone on the market right now. And it’s not just for the professionals and "artists", but for gamers (water cooling) and even for someone who is into music (great audio, dual speakers) and loves to watch Netflix (beautiful display). In short, the Note 9 is the complete package from Samsung both Note fans and Android fans have been waiting for. Don’t like the idea of an S Pen? It really won’t matter. The cost difference between the Galaxy S9+ and the Note 9 is barely Rs 4,000. Buy a Note 9 and don’t ever pull it out. It won’t get in your way. Don’t like the bigger display? Well, in that case you are probably not interested in phablet-sized devices anyways and you haven't even reached this far into the review. On the off-chance that you have, you could consider the Galaxy S9, Pixel 2 or even the iPhone 8. 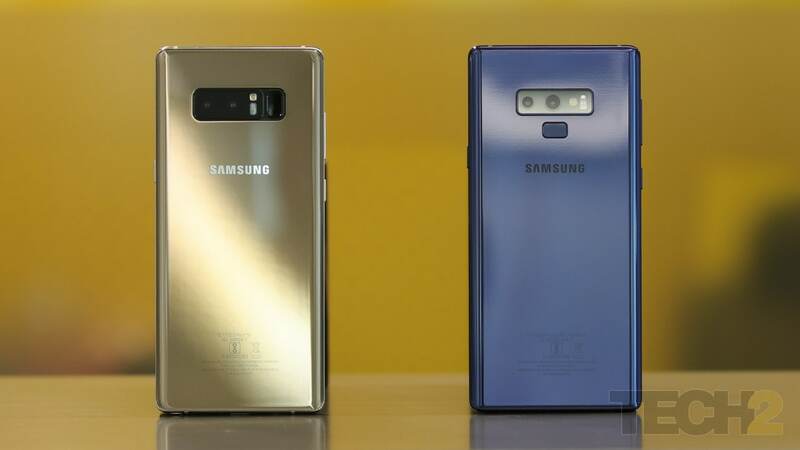 You just cannot hate the Note 9 simply because it offers the most complete smartphone package you can find. It’s good at everything it does and it even cannibalises its sibling the Galaxy S9+ when it comes to pricing and value for money. This is the best Note yet and the first one that changes things and separates the Note series from the S series. It’s new wine in an old bottle. And surprisingly, it tastes good! 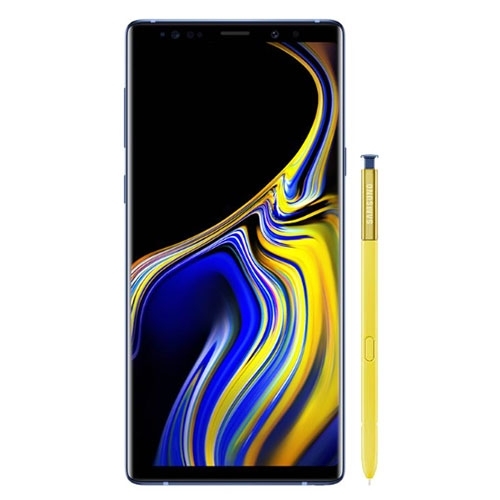 The Samsung Galaxy Note9 (128GB, 6GB RAM) features a 6.4-inch Super AMOLED display with a resolution of 2960 x 1440 pixels and is powered by a octa core processor and has 6GB of RAM. It comes with 128GB of inbuilt storage, expandable upto 512GB and has a 12.0 +12.0- megapixel rear camera and 8.0-megapixel front camera. It comes with Android 8.0 Oreo OS and support a 4000mAh battery capacity with 3G & 4G.